Today we're featuring a guest blog post by the amazing vegan blogger @cuteveg. Be sure to check out her website www.cuteveg.com show some warm Akasha love! 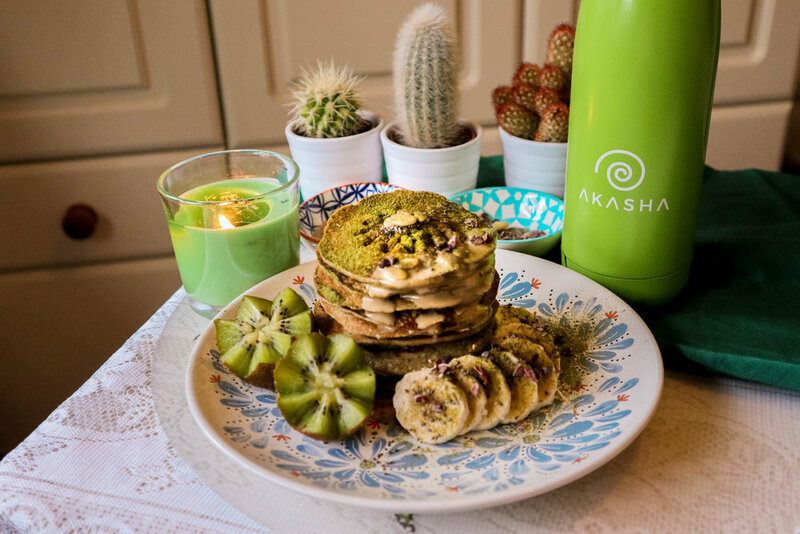 Howdy macadamia nuts, I'm going to share with you my earthy and delicious matcha and hemp cakes, topped with tahini, seeds, cacao nibs and all sorts of nutritional goodness. This is a collaboration with the wonderful, sustainable and reusable bottle brand @we.akasha(Instagram) https://www.weakasha.co.uk/ . Akasha, hold all the essential values of an ethical, economically friendly and sustainable company. Their BPA free bottle not only keeps hot drinks hot for 12 hours but also manages to keep cold drinks cold for 24 hours. By using reusable bottles every day, we as a society can reduce the consumption of plastic bottles, which are killing wildlife, natural habitats and polluting the ocean. I wholeheartedly believe in their principles and you should definitely consider purchasing their pristine bottles. I love incorporating matcha tea into my diet. Matcha tea powder boosts your metabolism from the polyphenol, called EGCG, or Epigallocatechin gallate, which is a natural phenol and antioxidant. Antioxidants are vital to slow down signs of ageing and fighting chronic diseases, the more we consume, the higher chance we have on fighting off infections and diseases. Matcha has several times more antioxidants than superfoods like: goji berries, blueberries and acai berries, all which are considered antioxidant powerhouses. Another wonderful benefit of matcha tea, is that although the caffeine contents in one cup is equivalent to around one cup of brewed coffee, the buzz you get from the caffeine is clean and calming which surprisingly can help aid in getting a good nights sleep, if consumed around six hours before you go to bed. Blend all the ingredients till they are smooth and pan fry the batter in small pancake sizes till air bubbles appear on the surface and then flip like you're Matilda!